HeadMouse replaces the standard computer mouse for people who cannot use or have limited use of their hands. 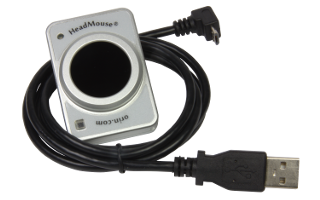 The HeadMouse translates natural movements of a user's head into directly proportional mouse pointer movement – move your head and the mouse pointer moves as well. The HeadMouse has a wireless optical sensor which tracks a tiny disposable target worn by the user on his/her forehead, glasses, or even a hat. It works just like a computer mouse, with the mouse pointer being controlled by head movement.